Yesterday, at the small corner grocery store, which also serves as a cafe, I had an interesting talk with a taxi driver that I know well – Jose Moreno. A cordial, well-spoken and articulate man, Jose often drives me on my errands or to pick up friends at the airport, as I prefer to not drive. After a few pleasantries as he waited for his meal to be prepared, the subject turned to ever growing problem of traffic in our small city. While there are only about 700,000 living in the area, on the weekends, the traffic swells with tourists, weekend residents from Mexico City and abroad to an estimated 2-million people. As he waited for his meal to be prepared, Jose told me how it was his belief that others drivers seldom understand or have compassion for others. An example that he gave was how he had recently driven past a car parked haphazardly on the side of the street. In the car was an older male driver and a female who was hovering over him at the open driver's side door, as if to shake him out of a sleep. Feeling that there was something wrong with the image, Jose pulled over a bit further down the street and returned to see if the women needed some assistance. As it was the man was having a heart attack and his wife was beside herself without knowing what to do to help her poor husband. Jose quickly called for an ambulance and tried to comfort the woman as much as he could until the ambulance arrived. While other drivers slowed to see what was going on, no one else bothered to stop to assist. Some honked their horns, as the driver's side door was open as Jose tried to comfort both passengers and partially blocking the path of oncoming cars. Seemingly, other drivers thought their right to drive down the street unimpeded was more important than whatever was going on with the parked car. The drivers in the passing cars seemingly lacked empathy for the man, his wife and the efforts of Jose. Empathy is the experience of understanding another person's current condition from their perspective. You place yourself in their position and feel what they are feeling. 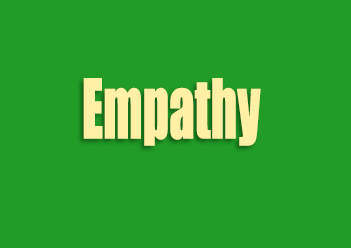 Empathy is known to increase prosocial (helping) behaviors. Empathy has long been a topic of interest to psychologists, but it has been studied in a sometimes bewildering number of ways. While our current culture might be socializing people into becoming more individualistic rather than empathic, research has recently uncovered the existence of "mirror neurons," which react to emotions expressed by others and then reproduce them. Hopefully, there may be some cure for those who lack empathy soon. 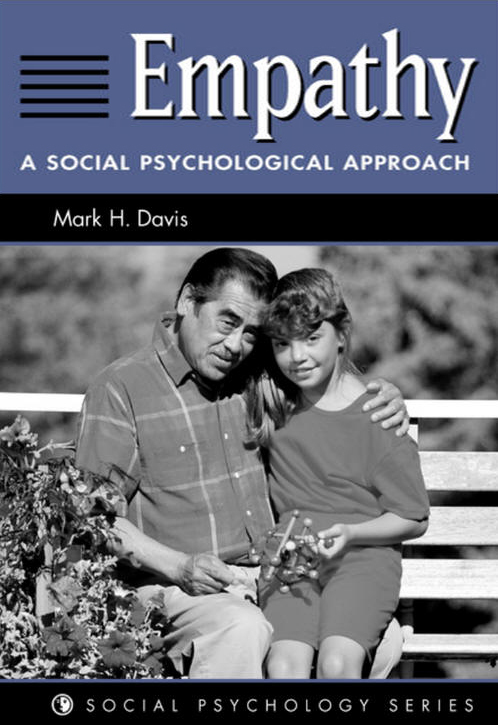 Psychologist Mark Davis, Professor Psychology, at Eckerd College, in his book, "Empathy: A Social Psychological Approach" suggests that there are 3 important types of empathy; Perspective Taking, Personal Distress, and Empathic Concern. These 3 types of empathy represent different aspects of our personalities. The first, "Perspective Taking", is a purely "cognitive" form of empathy. This is being able to see things from another persons point of view. Putting yourself in the position of another. It is important to better understand where someone is coming from, but it's not what we typically think of as empathy. A person high in "perspective-taking" empathy may be good at understanding others' points of view, but may not get very involved in others' emotions. A second type of empathy, and one that is represented (literally) by Jose Marino's action, Davis terms "Personal Distress." This is literally feeling another persons emotions. When Jose saw the woman in distress over her husband's illness, his "personal distress" action kicked in and he went to help. When you are watching a scary movie, and you start to empathize with those in the movie that are in distress and you begin to feel afraid, that is "personal distress" in action. You are actually feeling the other persons emotion through a process called "emotional contagion." The actor, or another person, is actually "infecting" you with their emotion. An individual high in "personal distress" empathy will, as suggested, be prone to experience others' emotional states, which has good and not-so-good aspects. This is the type of empathy that we most often think of when we hear the word empathy, i.e. to recognize or experience in our imagination the emotions, feelings or actions of another person. An individual high in "empathic concern" will feel in tune with the other person's emotional state, and whether it is negative or distressful emotion, they will feel and show appropriate concern. Going back to the "personal distress" type of empathy, we all experience some level of "personal distress", but too much of it may not be a good thing. We have all seen examples of "personal distress" escalation, usually in a relationship that is falling apart. Many couples who attend marriage counseling are suffering from this. While it is important to understand and feel empathy for others, you should never allow yourself to mimic their emotions. For example, if someone becomes sad over something you have said, the goal should be to act in a more loving and compassionate manner to resolve the pain that you inflicted upon them. If you mirror their sadness, you do nothing more than escalate the problem that you created. If a child expresses their fear of clowns you certainly would not suddenly become fearful of clowns. You would work to help the child to better understand their fear and decrease their anxiety. There are those have trouble controlling their emotions. These are the types that really get involved on a person basis with whatever is put in front of them; as an example they easily cry during emotional scenes in movies, forgetting that those on the screen are actors and the situation is not really happening. If they are unable to overcome their own sense of distress, they will overreact to their feelings and become so distressed that all they can think about is their own feelings of distress brought on by observing another person with a problem. They move beyond being able to feel any empathy as all for the other person and concentrate on their own stress. As the other person is not receiving any empathy they become more agitated by the lack of empathy and there is an escalation on both sides, which often results in a complete breakdown of communication. While, you may learn the importance of showing empathy to those come into your life, you cannot experience it until you actually begin using empathy in your life to increase your personal happiness. 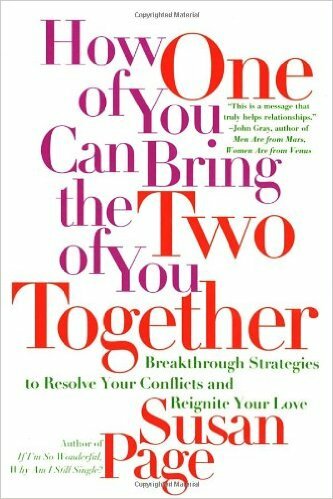 Renowned relationship expert and workshop leader, Susan Page who wrote, "How One of You Can Bring the Two of You Together", gives great advice as to how it does not take two people to make a relationship work. A key to making any relationship happen - showing empathy - is mentioned 61 times in the book in the 290 pages, which means that she mentions empathy on an average of every 4.75 pages. However, even when the author doesn't use the word empathy, she is using similar words and phrases; understanding, imagine, devotion, seeing the other person point of view, related to empathy. Obvously, empathy play a very big part in any relationship whether in a friendship or one of a committed, loving relationship. Having devotion for another; being loving, loyal, and having enthusiasm for another person is seen as a positive response. Thomas Merton, (1915 – 1968) was an American writer, Trappist monk, poet, social activist, student of comparative religion and priest. Although, you may remember him for his best selling book, "No Man is an Island," he also wrote among his many books, "Love and Living" in which he stated, "Love is the revelation of our deepest personal meaning, value, and identity." However, it would prove to be quite difficult to love or be loved without factoring in empathy. I mention the relationship between the two books to make the statement that few of us live on an "island of solitude", nor do most of us care to do so. We find ourselves seeking out the companionship of others and maybe even finding love in the mix. And, that is where the problem starts, we can't live in solitude, yet we do not understand how to live with others. Get rid of the negative influences in your life. First step to loving yourself, get rid of the people that don't love you. Take that step out of your comfort zone. How would that work out, if your goal is to truly live a life of joy and happiness, with others, or maybe someday finding the right person to spend the rest of your life with? If you get rid of everyone who does not currently love you, then you will be greatly lowering the possibilities of ever extending yourself past what is today. If you spend all your time doing only what you want to do, forsaking what a potential friend or loved one might want to do, you go further down the hill, and while you are stepping out of your comfort zone and active in meditating, while looking at yourself in the mirror, life just slips right by you. The rule has never been to love yourself, but to accept yourself. 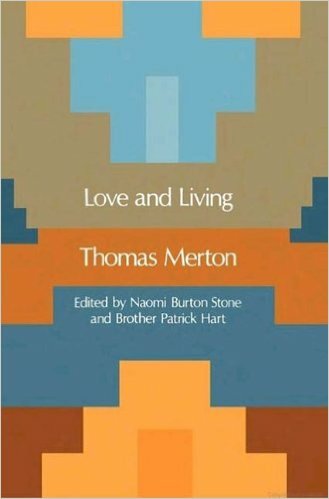 Even Thomas Merton, who lived a life of solitude as a monk, knew the importance of showing empathy to others. Of understanding that empathy is an important aspect of a healthy relationship. Indeed, we have to care more for the other person than we care for ourselves. Can those with "personal distress" apathy become depressed? As it turns out there have been many studies done on depression and apathy and the answer is a resounding yes. If you high in "personal distress" type apathy, there is a good chance that you will become depressed. A study published by the University of Oxford, on apathy and depression in the elderly involved a 68-year-old man who was refusing to eat and suffering debilitating weight loss. His wife had died a year earlier, and impaired mobility had led to an admission to a nursing home. The staff brought food to his room but were usually dismissed with a curt remark about not being bothered with food, although at times if food were left it would be eaten. Eventually things escalated from curt remarks to hostility and swearing, his sleep was disrupted, and he reported more back pain. He was admitted to the psychiatric unit where depressive disorder was diagnosed. They prescribed antidepressant and improved analgesia. But, now for the rest of the story. In addition to medication, the psychiatrists recommended the introduction of a structured behavioral program at reinforcing pleasurable aspects of eating and the assignment of nurses with more "empathic concern" that would eat with him in his room. Within weeks his overall health improved, his weight increased and his demeanor went from being negative to extremely positive. As it turned out his depression was caused by loneliness for the most part. But, it is not just the elderly that become depressed over the wrong kind of apathy. In studying hospice nurses who cared for terminally-ill patients, it was found that possessing "empathic concern" was positively related to the nurses' performance, but "personal distress" was negatively related. If hospice nurses felt their patients' pain (and family members' distress as well), it made them less able to do their job of providing comfort to the patient and family because they begin to focus on their own emotions more than the patients. And, subsequently they too became depressed. In reality, we all have some level of each of the types of empathy. The key is to understand the ways that we are empathic with others, and to realize the strengths and limitations of each type of empathy. Obviously you can feel you understand without intrinsically understanding. To understand intrinsically is to think you understand, while the feeling of understanding refers to how you think about your thinking. There are varying degrees of feeling that you understand. There is a wide gap between feeling as if don't understand something and feeling that you understand completely. Understanding becomes problematic when you hold on to the illusion that you believe when you do not. I brought my children up to believe the statement above and they still follow it to this day. If only the world could understand that by showing others empathy, they would be happier in life as the empathy was reflected back to them. Not just understanding empathy, but understanding the other person. Just as Jose understood that the women needed help with her husband. A healthy relationship needs to focus on the outcome of a behavior; some plausible function of that outcome that can account for the emotion or feeling itself. This is notably easier in some cases than others: understanding hunger motivates people to seek out and consume food avoiding starvation; understanding fear motivates people to escape from or avoid threatening situations, avoiding danger; understanding guilt motivates people to make amends and repair relationships towards those they wronged, avoiding condemnation and punishment while reaping the benefits of social interaction. The distinction I would like to draw is between understanding per se and the feeling of understanding. The examples given the dictionary reflect understanding per se: the ability to draw connections among mental representations. Understanding per se, then, represents the application of knowledge. A person that understands the feelings that another after they say something hurtful, is more likely to not continue to repeat the habit of being hurtful and be substantially happier because of their apathy towards others. The term coulrophobia describes the fear of clowns in informal studies. In the Space To Care study aimed at improving hospital design and physicians' office settings for children, researchers from the University of Sheffield polled 250 children regarding their opinions on clowns; all 250 children in the study, whose ages ranged between four and sixteen, reported that they disliked clowns as part of hospital decor. Many of them, including some older children, stated in the poll that they, in fact, actively feared clowns. Researcher Dr. Penny Curtis said, "We found that clowns are universally disliked by children. Some found the clown images to be quite frightening and unknowable." According to Ron Doctor, Ph.D, (Doctor Doctor; his real name!) a psychology professor at California State University, Northridge, young children are "very reactive to a familiar body type with an unfamiliar face".